Farmers and home gardeners alike are eager for the soil to warm up so they can get out and start planting. While growing 1,000 acres of corn isn’t the same as growing a 10-square-foot backyard vegetable garden, there are surprising similarities. Crop farms have full sun, day in and day out. Vegetables need at least 6 to 8 hours of light, so a sunny location is essential. your-soil-before-planting/). Adding organic matter, such as animal manure, green manure, peat moss or compost to soil helps improve soil health. Farmers purchase seed in bulk from dealers, often locking in prices during the previous fall. Also, farmers may select seed treatment to combat fungus, diseases and insects. Gardeners should purchase seed from a reliable source. Some gardeners start seeds indoors so they can put in young plants in spring to get a jump during South Dakota’s short growing season. 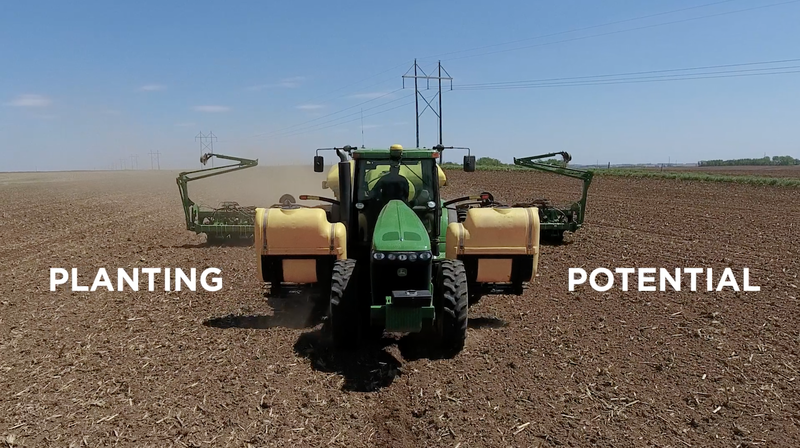 Farmers use a wide variety of tillage practices, depending on their location, soil type, crop and management strategies. Some farmers plow before planting; others plant on top of last year’s crop residues (no-till) and some split the difference (strip till). Gardeners can prepare the soil for planting by plowing, rototilling or spading, up to about 8 inches in depth. Other gardeners don’t plow—similar to no-till farming—but will remove the debris from winter. Farmers are at the mercy of Mother Nature when it comes to water for crops. In chronically hot, dry areas, some farmers use irrigation. Between rain and watering, give your vegetables 1 to 1-1/2 inches of water per week. Gardeners in hot, dry areas may use irrigation. When you water the garden, apply enough at a time to saturate the top 8 to 12 inches of soil, which allows water to reach the root zone. Farmers typically need to replace any nitrogen, phosphorus, calcium and potassium lost in their soils. Nutrients can come from organic matter (such as crop residue), fertilizer and cover crops. Vegetables need many of the same nutrients as crops. Gardeners can add fertilizers or rely on adding organic matter. South Dakota soils tend to have adequate potassium but not enough nitrogen. Soil testing (see link above) can help determine nutrient needs. Weeds and insects wreak havoc on crops unless they’re controlled. Farmers use a variety of strategies to protect crops, including precision agriculture technologies, tillage, herbicides and/or insecticides, crop rotation, cover crops, seeds with built-in resistance, biological control and more. Gardeners have a distinct advantage over farmers because manually weeding a garden is possible, whereas on a farm it’s not feasible. Experts say gardeners should pull weeds early. Additional methods include herbicide use and mulching, which is recommended in South Dakota because it helps conserve moisture in dry and windy conditions. Growing anything can be challenging at times. However, seeing the results of your hard work is tremendously rewarding—for both farmers and home gardeners.